Ubud is a magical place that has been attracting visitors, tourists and artists from all over the world for more than 100 years. The people of Ubud today continue a unique combination of traditions based on rice-field cultivation, a rich Hindu-Bali religious ceremony cycle, and a dynamic life of dance, music, art and sculpture. Since the 1930s Ubud has also attracted Western and other Asian artists; and since the 1990s the town has developed a name as a traditional healing centre, a centre for yoga and meditation; and increasingly, a gourmet diner's paradise! Andong, where the Villa Sukmawati Estate is located, is just 2 kilometers (1.25 miles) from the centre of Ubud, and is a renowned handicrafts district. Just up the road are the villages of Gentong and Tegallalang, where craftsmen can make anything out of wood, glass or metal. It is fascinating to return year after year to see what new knick-knack has appeared in the shops. The locals' creativity is amazing. 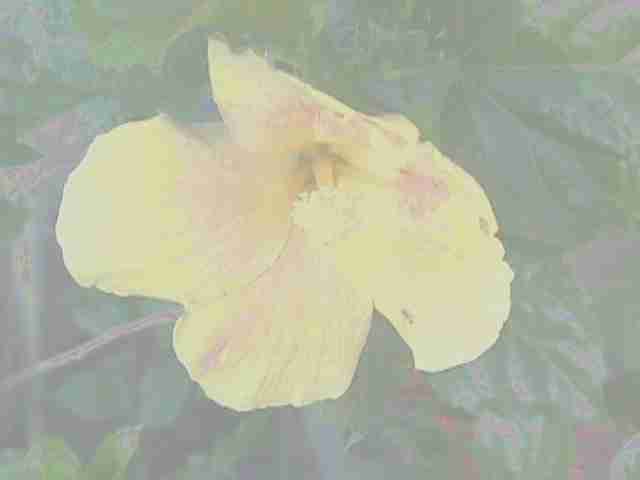 The district of Andong is named after the distinct red-flowered shrub that is commonly seen in this part of the district. We have some growing around our swimming pool. Just next door to our driveway is Jalan Nagi Lama, a small motor-bike only lane leading to the village of Nagi. 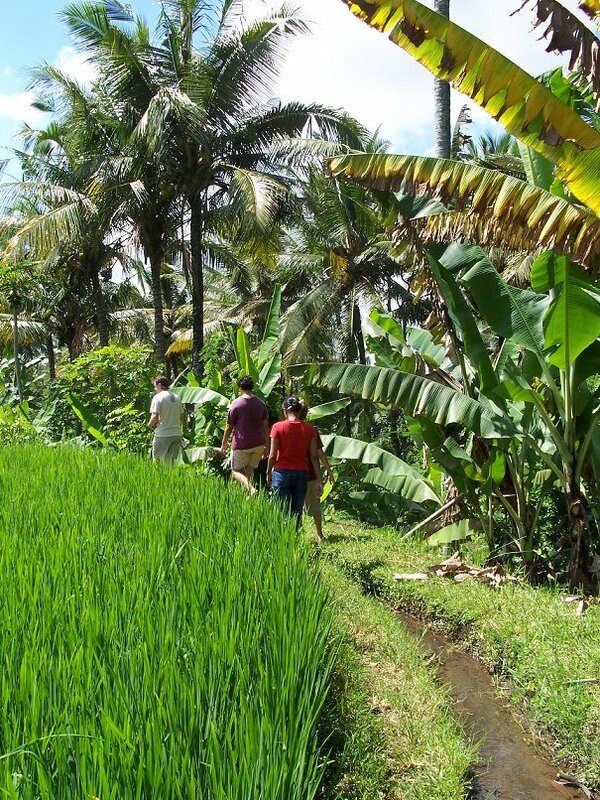 This is a delightful walk through the rice fields, and through the traditional Nagi village. Further north along Jalan Raya Andong from the Villa Sukmawati Estate is the turn-off to Petulu village, where you can watch the famous White Herons (Kokokan birds). From Villa Dharmawan these lovely birds can be seen in the evenings returning to roost in Petulu. Bike ... hire a mountain bike and explore the villages of Ubud. While traffic along the main roads is often busy, only local traffic passes through the villages and riding the back lanes of Ubud is a delight. Note: there are some steep hills! You can also join a bike riding tour - the tour company will pick you up from the villa and drive you to Kintamani: you can then coast downhill through picturesque villages to Ubud or the nearby village of Pejeng. Drive ... hire a car and explore further afield. Exit the Villa driveway and turn right then just go straight uphill - a one hour drive takes you to Kintamani, the town on the ridge overlooking the Mount Batur volcano and caldera. Fantastic views, and some reasonable restaurants for lunch. 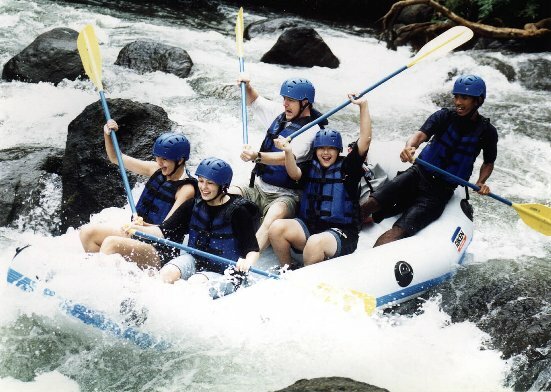 Go white-water rafting, canyoning, diving or ride elephants: numerous tour agencies in Ubud can organise these activities for you. Most tour companies will pick you up from the villa. Painting and sculpture: visit the art galleries (Neka Museum, Puri Lukisan, Rudana Museum, Agung Rai Museum of Art and many other smaller commercial galleries). Watch a traditional dance performance: every evening in the forecourt of the Ubud Palace there are dance performances; in the front courtyard of Puri Kantor there are frequent dance performances, exhibitions and other events, and there are also dance performances for visitors in many villages around Ubud. Get into some serious literary discussion at the annual Ubud Writers and Readers Festival.